A study led by The University of Western Australia has found plants have far more complex and developed senses than we thought with the ability to detect and respond to sounds to find water, and ultimately survive. In the study "Tuned in: plant roots use sound to locate water" published in Oecologia, UWA researchers found that plants can sense sound vibrations from running water moving through pipes or in the soil, to help their roots move towards the source of water. The study also revealed that plants do not like certain noises and will move away from particular sounds. Lead researcher Dr Monica Gagliano from UWA's Centre of Evolutionary Biology at the School of Animal Biology said water was a basic need for a plant's survival, and the study showed that sound plays a significant role in helping plants cater to this need. 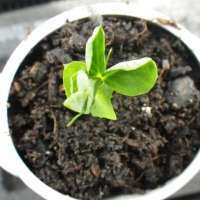 "We used the common garden pea plant (Pisum sativum) as the model for our study and put the plant into a container which had two tubes at the base, giving it a choice of two directions for the growth of its roots. "We then exposed the plant to a series of sounds, including white noise, running water and then a recording of running water under each tube, and observed its behaviour. The scientists found that the plants could tell where the source of the water was and their root systems grew towards that source based on sensing the sound of running water alone. "It also was surprising and extraordinary to see that the plant could actually tell when the sound of running water was a recording and when it was real and that the plant did not like the recorded sound." Dr Gagliano said when moisture was readily available in the soil, the plant did not respond to the sound of running water. "From this we begin to see the complexity of plant interactions with sound in using it to make behavioural decisions," Dr Gagliano said. The research has important implications for understanding the behaviour of plants and how it affects their survival. "It indicates that the invasion of sewer pipes by tree roots may be based on the plants 'hearing' water and shows that their perception of their surroundings is much greater and far more complex than we previously thought." "In the animal world there is a strong call to understand how acoustic pollution adversely affects populations, but now we know plants also need to be part of these studies."